Jamie Wyeth painted “Portrait of Shorty” when he was just 17 years old. A gifted, restless, in many ways likable artist, Jamie Wyeth is the subject of a retrospective — his first in more than 30 years — at the Museum of Fine Arts. The show, which was curated by Elliot Bostwick Davis, the museum’s chair of the Art of the Americas, is full of incidental fascinations. But is it a body of work worthy of such lavish treatment in one of the world’s great museums? I’m scratching my head. 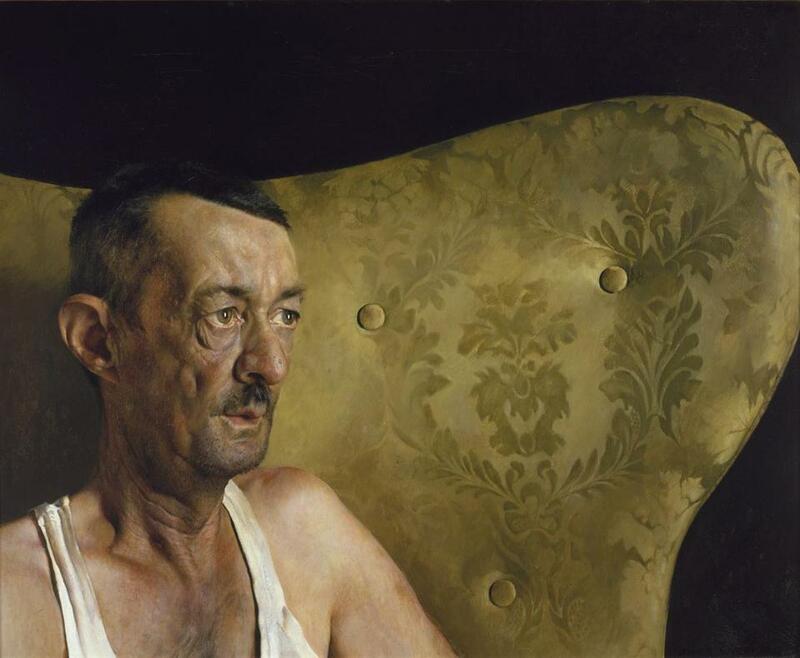 Wyeth, who has just turned 68, can paint. He can draw. He has lived an interesting and impressive life. But what’s missing from this show, which covers six decades and is made up of more than 100 oils, watercolors, drawings, and even a couple of humorous tableaux vivant, is a sense that it all adds up to something original — something that goes beyond the frisson of family gossip, the sentimentality of a compelling life story, or the romance of a storied place. Too often, in place of the deep-down conviction that marks out exceptional artists, Wyeth gives us an awkward amalgam of capability and whim. It’s not quite enough. That said, the capability is beyond dispute, and it’s on display from very early on. The show, which will travel to three US venues after it closes in Boston, begins with a series of children’s drawings. They were selected by Davis from a cache of more than a thousand that Wyeth’s mother kept. Andrew Wyeth’s own father, the illustrator Newell Convers Wyeth, died the year before Jamie was born. Jamie’s aunts, Carolyn and Henriette, were also practicing artists, and there were other artists — sons-in-law of N.C. Wyeth — in the family. An inspiring if daunting milieu for a creative kid to grow up in. At the age of 11, Jamie convinced his parents to let him leave school in order to focus on his art. He was home-schooled by a tutor in the mornings, and in the afternoons went to study art with his aunt Carolyn, who had taken N.C. Wyeth’s studio as her own. Rush forward a dozen years, and what becomes clear is not only what startling aptitude Jamie had, but what a challenge it must have been for him to become his own man, artistically speaking. A portrait he painted in 1969 of his father shows the old man with a meaty chin, a strong nose, and narrow, intent eyes. He emerges from enveloping gloom wearing a dark military overcoat with big, shiny buttons that descend in an arc, like time-lapse images of a coldly orbiting moon. A self-portrait Jamie painted that same year is also on display in this first introductory section. At 23, he shows himself shirtless, from the midriff up, looking into a mirror at a slight angle. One side of his young and rosy face is cast in shadow. The low vantage point and off-center composition create the impression almost of a recoil. The combined sense of hesitation and of youthful fragility make for a poignant contrast with the inflexible severity inscribed in the face of his father. Both works came four years after “Portrait of Shorty,” described by Davis as “the culmination of [Jamie Wyeth’s] early years as an apprentice within his own family circle.” It is indeed an amazing picture — all the more so when you register that it was painted by a 17-year-old. It shows a local, Chadds Ford, Pa., character known as Shorty, who has deep, wrinkled pouches of skin under his eyes, a short, bristly mustache and an unshaven chin. He wears a white singlet, or “wife-beater,” and his head, painted with fastidious, almost Flemish, realism, rests, dissonantly, against the wing of an armchair expensively upholstered in green brocade. More portraits followed in the years ahead, including one rendering of the impresario Lincoln Kirstein (1965), and a commissioned, posthumous portrait of John F. Kennedy (1967), which Wyeth recently donated to the MFA. 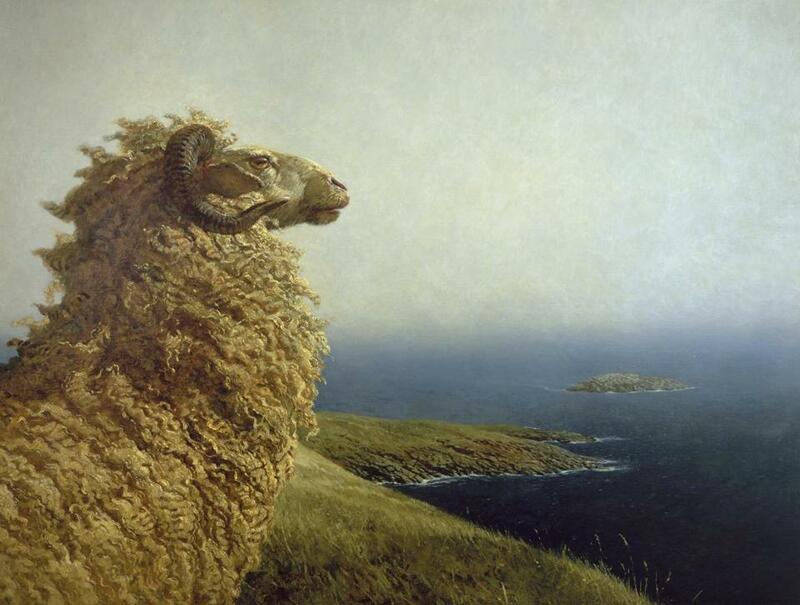 Kirstein, who had been an early advocate for Andrew Wyeth, took a shine to Jamie. When Jamie Wyeth was 20, Kirstein called him the “finest American portrait painter since the death of John Singer Sargent.” Kirstein introduced Wyeth to the world of ballet, and through a connection to a hand surgeon, arranged for the artist to study anatomy in a New York City morgue. Anatomy and ballet came together in a long series of drawings and studies Wyeth made of the great dancer Rudolf Nureyev in the late 1970s. By now, Wyeth was part of the circle of Andy Warhol, to whom he had been introduced in the mid-1960s. They had a joint exhibition together in 1976, and that same year, they painted portraits of one another. Warhol’s portrait of Wyeth is a classic silkscreen in pink, blue, and black. It dominates the room, and brings a note of solid conviction to what is already, in this second room of the show, a misfiring affair. 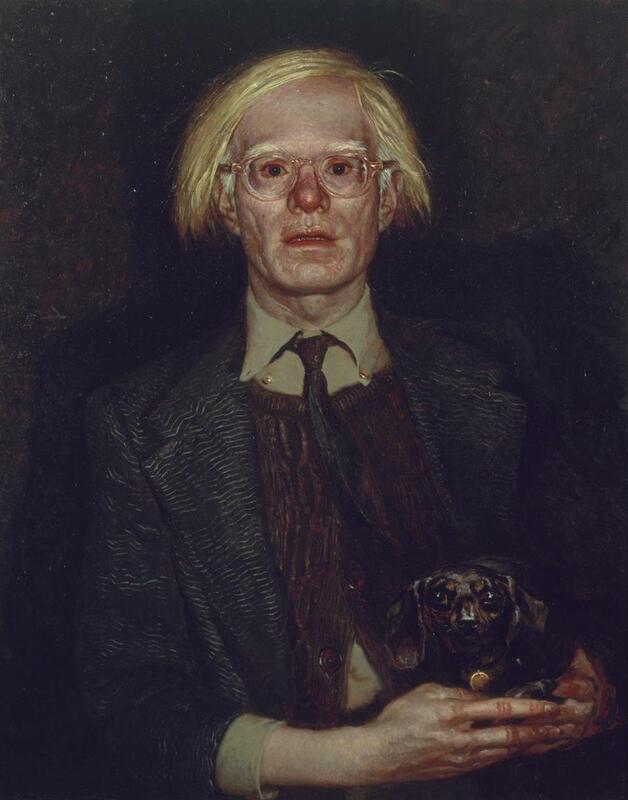 Wyeth’s reciprocal portrait of Warhol — nursing his pet dachshund and wearing a sallow expression of freaked-out stupor — isn’t bad at all. But already by this point it was becoming clear that Wyeth didn’t quite know what to do with his talents. Should he, with his gift for portraiture, pander to the celebrity fanciers, and try to become a late-20th-century Sargent? (But hadn’t that territory already been claimed, far more convincingly, by Warhol?) Or should he revert to the family romance and indulge his idiosyncrasies? The show is organized by theme rather than chronology. At times, this gets confusing. The room dedicated to portraits, for instance, contains images of Warhol or Nureyev made in the ’70s alongside reprises of the same subjects, presumably done from photographs or memory, from the ’90s and 2000s. The third and fourth sections of the show take us away from the heady, urbane worlds of Kirstein, Warhol, and Nureyev to the Wyeth family’s rustic bases in the Brandywine River Valley, southwest of Philadelphia, and in Maine (Jamie has had a studio on the isolated island of Monhegan since 1968). In the Maine gallery, there are evocative images of bell towers, church facades, and weather-beaten coastal houses in an idiom and color palette reminiscent of Wyeth’s father’s work. (Elsewhere, Jamie’s work is chromatically richer, and juicier; he favors oozing oils over his father’s chalky tempera). And in the gallery devoted to Brandywine, there are fine renderings, again in watercolor, of tree trunks, owls, dragonflies, and — best of all — a row of bare trees with exposed roots by the banks of a depleted river. 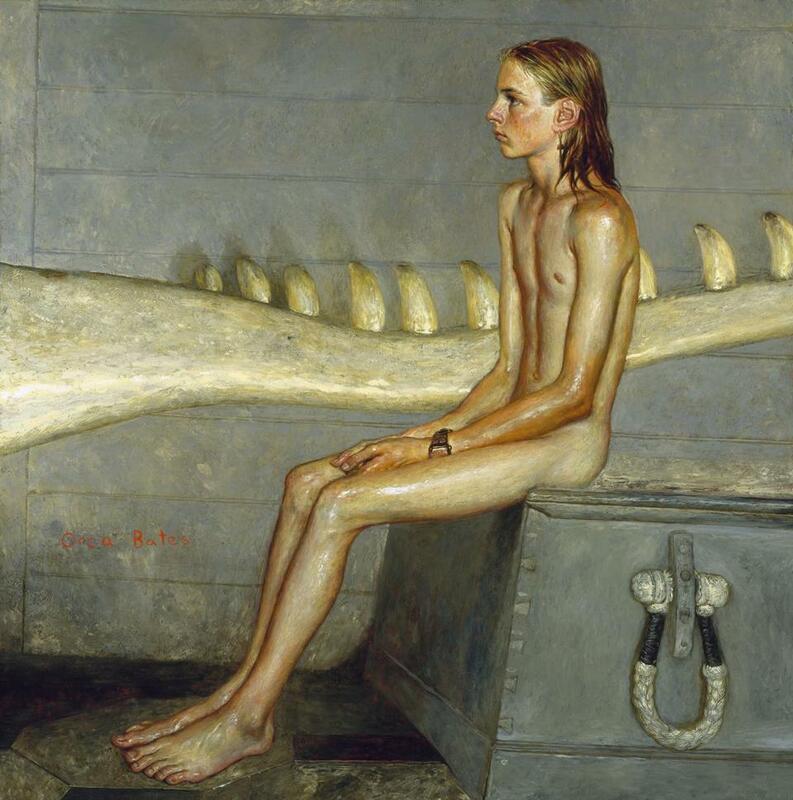 But Wyeth’s portraiture continues to stand out: His 1990 painting of Orca Bates, a skinny, adolescent boy from the Maine island of Manana, just off Monhegan, is the next best thing in the show after “Portrait of Shorty.” Bates is shown, symmetrical and self-possessed, seated on a seaman’s chest, in a full length profile that calls to mind Whistler’s “Arrangement in Grey and Black No. 1” (more commonly known as “Whistler’s Mother”). The boy’s long blond hair is wet. He is naked but for a watch on his wrist. Behind him, an undulating whale jawbone extends horizontally across the picture, reinforcing its slight, seasick tilt. It’s a startling image, charged by dissonant details, and — not least — by the confidence of its rendering. Much of the work in the rest of the show courts peculiarity, and fails to connect. A lot of it is in a storytelling vein that harks back more to N.C. Wyeth than to Andrew. It includes pictures of flying pumpkins, of sea gulls acting out parts in a series illustrating the Seven Deadly Sins, and of the artist’s beautiful wife, Phyllis. Wyeth met Phyllis Mills when he was just 12. She later became one of his models. She was a champion equestrian, and worked as an aide for John F. Kennedy. Her neck was broken in a car accident when she was 21. She and Wyeth married in 1968. Despite her injuries, Phyllis later took up carriage driving, and Wyeth painted a number of large portraits of her capably holding the reins. All are sentimentally affecting. But it’s hard to feel that, as works of art, they ever transcend their conventional limitations. It’s the same for most of the rest of the show. Some of the works feel too anecdotal (“Meteor Shower,” 1993); others too cute (“Wreck of the Polias,” 2002); others simply wooden and stiff (“Twins,” 1990). A low point arrives in the final, darkened room, when we are asked to admire a painting of a sea gull on a shell-strewn shore in a frame made from actual shells, and shortly after, a stormy seascape called “Sea Watchers,” which features the artist’s mentor figures — Warhol, Winslow Homer, and Andrew and N.C. Wyeth — looking out to sea, like parodies of Casper David Friedrich’s 19th-century spiritual seekers. It’s the kind of fare, to be brutally honest, one expects to see in commercial galleries in seaside resorts, not at an institution of the Museum of Fine Arts’ stature. The catalog goes to great lengths to draw connections between Wyeth and everyone from Giotto to John Singleton Copley and Honore Daumier — not to mention Beethoven, and Wagner. It’s all well-intended, but none of it is quite convincing. 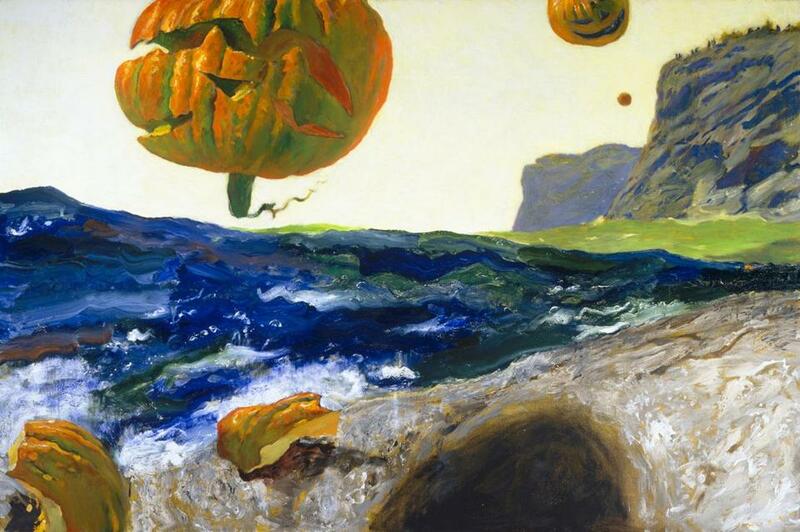 In truth, “Jamie Wyeth” is just the kind of exhibition we have come to expect at the MFA under Malcolm Rogers. It hits all the notes that make it irresistible: traditionalist skills; the sparkle of Camelot; the shimmer of Hollywood (a portrait of Arnold Schwarz-enegger); a leavening dollop of something vaguely up-to-date (Warhol and the Factory); intergenerational family drama; abundant views of the New England landscape; and some awfully cute small dogs. Why even bother to protest, or try to think of other artists whose work might have benefited from so much attention? Under the cover of its specious war on “snobbery,” the MFA is running in a different race.